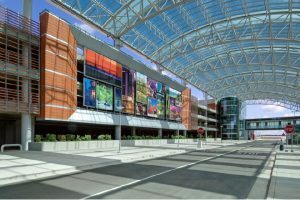 The Gerald R. Ford International Airport, or GFIA, had a rather impressive 2016 as it not only grew its number of nonstop flights and announced new executive leadership, but also improved airport security, invested in the latest maintenance equipment, and continued to build on what promises to be a transformative $45 million project. 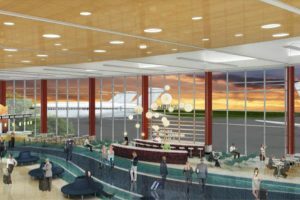 The Grand Rapids-based international airport’s breathtaking $45 million Gateway Transformation Project comprises a consolidated checkpoint, restrooms, nursing rooms, kids play area, business centers, new lighting and terrazzo flooring, and new retail, food and beverage options. Among the many highlights of the Gateway Transformation Project, a new Prospect Hill Brewhouse, under a partnership with Founders Brewery; and Starbucks Coffee both pre-and-post security checkpoint are planned. Customer service at GFIA continues to receive national recognition, and drive home the promise of “getting there is better here.” With more than 120 daily flights to approximately 20 cities served by five airlines, and the finest customer service in the Midwest, GFIA is becoming known for its West Michigan charm, first-hand service, and friendly smiles. Along the way, the Airport hosted a record number of travelers in 2016, becoming the 10th fastest growing of all large, medium, and small hub airports in the country. More than 2.6 million people in 2016 choosing to fly through GFIA, and it is currently on pace to surpass the record once again in 2017—an accomplishment promising a consecutive five-year, record-breaking total. With the addition of low-cost carriers, such as Southwest Airlines in 2013 and Allegiant Air in 2009, fares are dropping at GFIA. 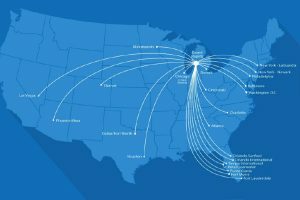 Airlines are investing in West Michigan, which can result in increased options, lower costs, and better service at the Ford Airport. Legacy carriers serving Grand Rapids including Delta Air Lines, American Airlines, and United Airlines are also continuing to grow and thrive at GFIA. 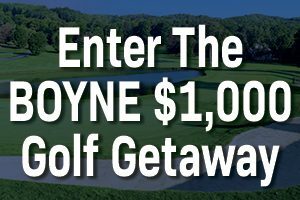 Dallas, Houston, Las Vegas, Minneapolis, Atlanta, New York, Chicago, Washington D.C., Orlando, Charlotte, and Philadelphia are a few of the largest metropolitan areas in the nation a short nonstop flight away from Grand Rapids through the growing service options. The Airport’s Therapy Dog Program – started in 2013 – is a favorite among passengers. In 2015, the Airports Council International voted GFIA as the top ranking airport for quality service in North America based on its size of two-to-five million passengers. The recognition highlighted GFIA’s travel experience from curbside to gate as the best in its category and tied for second in the region. 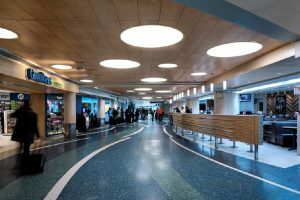 Not only does the Airport offer free Wi-Fi, complimentary business centers, kids play areas with coloring books, and local art, but also wheelchair and skycap services, and a GFIA therapy dog program. 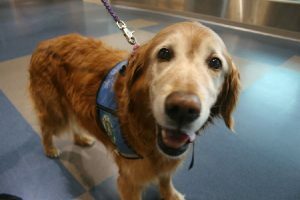 The program provides passengers with all the free licks, wags, and hugs needed for a comfortable travel experience for those who may experience anxiety while flying—or for children who need a little extra companionship to keep busy while awaiting their flight. GFIA has affordable parking and features more than 4,000 spaces in a garage to keep vehicles covered and protected. Another option available through GFIA comprises valet service or having a detail done while on vacation or business trip. Concourse B at the Gerald R. Ford International Airport includes the MI Tap Room – serving local Michigan craft beer & fresh, local food, and the Grand Rapids Magazine Travel store with local Michigan products.